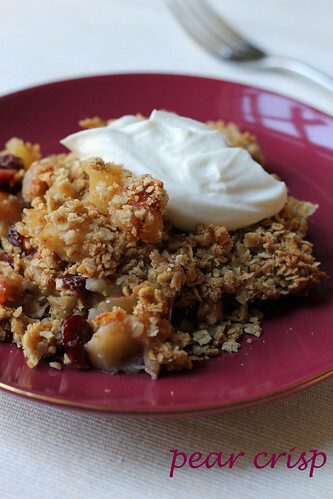 Pear Crisp with Oat Streusel Topping and a BOOK GIVEAWAY! I think we’re officially in the thick of it…the season of overindulgence, that is. For me, it began with a bag of leftover Halloween candy. Before it ends in a pair of Pajama Jeans, I need to keep moderation at least somewhere in mind. Seems that a copy of a new book called Cooking Light Way to Bake fell into my hands at just the right time. I could use a little lightening up for everyday baking at this time of year, and the thing I appreciate about Cooking Light’s recipes is that they focus on getting the most out of a restrained amount “real” ingredients rather than using weird substitutions. This book has lots of how-to’s and runs the gamut of baked stuff– cookies, cakes pies, breads– and a few non-baked things, like pudding and pancakes, too. I am absolutely drooling over the photo of Sweet Potato-Buttered Rum Flan, but I’m starting with a pear crisp, because it’s fall and a fruit crisp sounds good right about now. Baked pears are a nice change from apples here, although I am sure you could switch the two if you wanted to. I dotted the pears with dried cranberries. The streusel topping is loose because there’s not a ton of butter and sugar to hold it together in clumps, but it is indeed crisp and very oaty. I’m sure a scoop of vanilla ice cream on top would be the jam here, but in keeping with a lighter touch, I topped this with a spoon of honey-sweetend nonfat Greek yogurt. So, before I give you the recipe…I promised you a giveaway. The nice folks at Oxmoor House sent me a copy of this book, and they want to send one of you one, too. Just leave me a comment (one per person, please) on this post before noon on Wednesday (November 23) and I’ll randomly choose a winner from the list. Be sure your e-mail address is correct so I can contact you! -To prepare the fruit, combine the first six ingredients in a large bowl and toss to combine. Spoon mixture into an 11 x 7-inch baking dish coated with cooking spray. -To prepare topping, lightly spoon flour into a dry measuring cup; level with a knife. Combine flour, oats, sugar, 1/8 teaspoon cinnamon, and dash of salt in a small bowl; stir to combine. Cut in butter with a pastry blender or two knives until mixture resembles very coarse meal. Sprinkle oat mixture evenly over pear mixture. Bake at 375° for 50 minutes or until browned on top. Please note that the publisher, Oxmoor House, sent me a copy of this book. This recipe looks great. This will be our second dessert option for Thanksgiving. Hahaha pajama jeans…we’ve all been there. The crisp looks great! I’d love to win this book. I’ve been a Cooking Light subscriber for years. the cookbook sounds awesome – thanks! Nice giveaway from one of favorite cooking magazine! Thanks! I never thought of crisp with pears. That looks so good! I used to subscribe to Cooking Light.. before I moved to Israel… shame that I can’t get it here, I miss it! That crisp looks nice and comforting right now…. especially during this cold and rainy weekend! Enjoy! This dish looks great and I love the addition of dried cranberries. Dried cranberries are my current favorite add-in ingredient to many sweet and savory dishes. Sweet potato buttered rum flan sounds amazing!!!! This pear crisp both looks and sounds lovely! I love cooking light, too, they always have great recipes! I make a similar crisp using apples, pears and dried cranberries – the staff where I work all come “sniffing around” when I have my students make it. Mmmm, yummy! would love love to win this book…crisp looks lovely..
Now that Tuesdays with Dorie is ending, some light dessert recipes might be just what I need! Anything with pears and oats is worth trying. Thanks for delicious giveaway! Your crisp is lovely and I think we all need a little more ‘cooking light’ this time of year especially! Have a great Thanksgiving! This looks fabulous, Steph! 🙂 Happy Thanksgiving to you and yours! Looks like a good book! I will be checking it out for sure. That does look fabulous — although the browned butter and pumpkin cake is going to be the thanksgiving option.